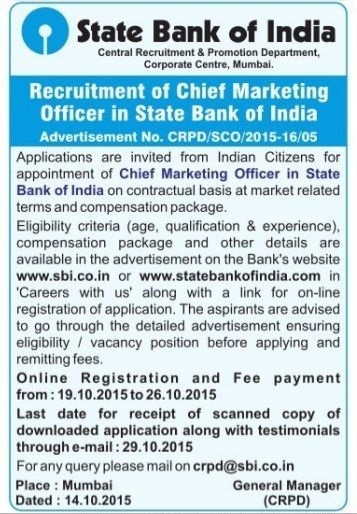 State Bank of India (SBI) has published a Advertisement for below mentioned Posts 2015. Check below for more details. Educational Qualification : The candidate should essentially have bachelor’s or master’s degree in Business Administration in any discipline from a recognized university or a reputed institute. Preference will be given for specialization in Advertising or marketing in MBA/BBA. . Candidates will be short-listed for Personal interview, based on their qualification, experience and overall suitability. Application Fee: Rs. 1000/- (Rupees one thousand only) Application Fee once paid will NOT be refunded on any account nor can it be held in reserve for any other examination or selection. How to Apply: Candidates can apply online from Recruitment Page of Bank’s website www.statebankofindia.com or www.sbi.co.in >> careers with us >> Appointment of Chief Marketing Officer in State Bank India 2015 for detailed guideline and procedure regarding a) Application Registration b) Payment of Fees c) Photograph & signature scan & upload.